I recently filled you in on recognition in the 8th International Color Awards, and I feel compelled to keep you up to date regarding additional recognition. This recognition concerns the PhotoPlace Gallery in Middlebury, Vermont. This gallery is strictly for photography and their themed exhibits change monthly. You last saw two of my exhibited photos in my article The Results Are In! Part 2, 3, 4, 5 & 6 (it was part 5, by the way). Today's article covers three different exhibits -- one past, one current, and one upcoming. Here are the works that have received recognition. FYI: You can see a slideshow recap of all awards, recognition and accolades by clicking the RECOGNITION link on my webpage. This photo is titled "Movin' On". It was taken on a wonderful day in The Highlands of Iceland. The vehicle in the photo was one of eight or so that I saw that day on this 160 mile road. And the road? It is exactly as you see it here for its entire length. Want to see a bit more of Iceland? See my YouTube video. 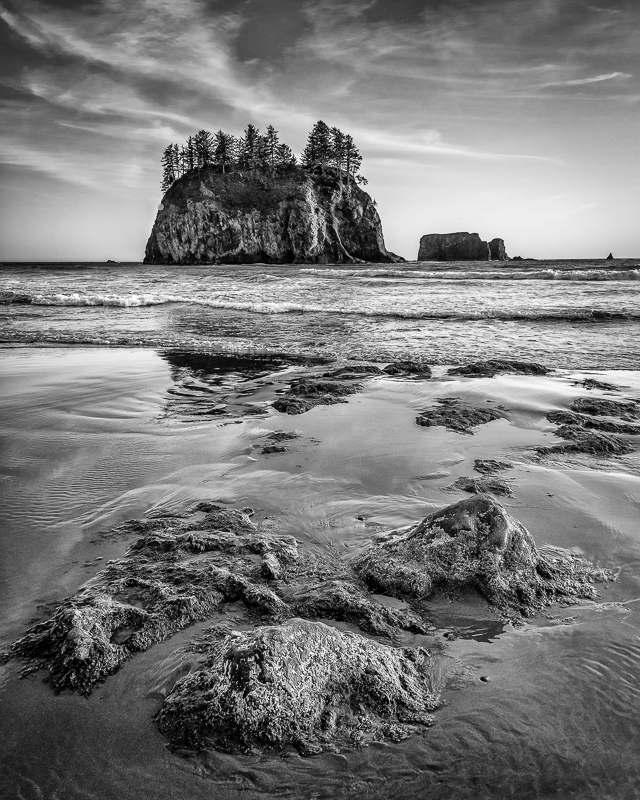 Two photos were selected for the current Up Close And Personal exhibit. This first photo is one of my favorite flower photos. There are millions of dogwood trees blooming in the southeastern U.S. in the spring, and I enjoy seeing them. Traveling one of the many narrow back roads of Tennessee, I was able to capture this photogenic dogwood branch. As I traveled through the southeast last month, I was again treated all along the way to these spectacular blooms. Here is a dandelion puff that you may have seen before. It was one of my first recognized photos from when Black & White Magazine had a companion color photo contest in 2012. My wife, Ellen, and I were picnicing in Vail along Gore Creek when I spotted this healthy puff. I used a bit of strategery to pluck just a few of the seeds to reveal the heart of the puff in this photo which I have titled 'Puff Fluff'. Here is the color version from Black & White Magazine, which received a Silver Award back in 2012. It is just the upper-right quadrant of the same image, above. Both the photographer Ansel Adams and painter Georgia O'Keefe made the San Francisco de Assisi Church at Ranchos de Taos, New Mexico, famous in the early 1930s. My more modern version is just below. 'Ranchos Morning' was indeed taken in the morning. I believe that the passing bird adds to the drama of this fabulous adobe church, which was completed in 1816. In her Juror's statement, juror Laura Moya cited this photo in particular as she said, "Details in some of the imagery stick with me...a hawk soars above the famed Ranchos de Taos church...". I am always pleased when a juror or jurors single out my work for recognition. That is not the driving force in my photographic work, but it does give one a boost when it is received! Have you ever been going through your email, with the intention of cleaning up old emails, and then way down the list, you find a whole batch of emails that you had overlooked and they were never opened? I did that recently. What I found was more good news about the results of photographic competitions I had entered. I want to present those decisions to you in this blog…a bit belated, I know. Also, I have had some photos accepted for gallery exhibition recently and I’ll show you those, too. On July 13th, I filled you in on the 7th Annual International Pollux Awards in a blog titled, “The Results Are In”, so I’ll continue in that same heading for this an any future horn-tooting blogs. So that previous email was Part 1 -- so now you get Parts 2 thru 6 of recent accolades. Note: Even though this web site is generally about things Italian, please don't be disappointed as you will see many recognition photos below which are not related to Italy. This notification came from an email sent last November – I really need to try to keep up with emails, don’t I? This is another one of those big contests, which they describe as follows: “The judges reviewed thousands of images submitted from 76 countries. The nominated photographers were selected by highly acclaimed industry professionals, including: gallery owners and curators (Greenaway Art Gallery, Valid Foto Gallery, Susan Spiritus Gallery, Emon Photo Gallery, Immagis, Gilman Contemporary, Tokyo Arts Gallery, Galeria Chroma, Strother Fine Art, McGaw Graphics, Editions Braun), publishers (Kehrer Verlag), editors (Digital Camera Magazine, PhotoBulletin, Soura Magazine, Asian Photography, Art World Magazine) and renowned photographers (Michael Levin, Hengki Koentjoro, Sudhir Shivaram, and Laura Zalenga).” As I look at the photos from the other competitors, I’m very pleased and humbled to be within their midst. Another interesting contest name. No idea how ‘spider’ creeps into the name (and that in itself sounds creepy, doesn’t it). But I did read on the internet recently that spiders have begun to take up photography – at least the black and white spiders are doing that. Everything on the internet is true, isn’t it? This one was actually announced in October of last year and was in the same email batch as the Neutral Density Award email that I had missed – what was I doing last fall instead of reading my emails? I can’t remember, but I’m sure it was more fun than reading emails. With 8,508 entries from 75 countries, this is another one of those huge contests. Their notification email said, ‘...your work received a high percentage of votes overall. Certainly an achievement, well done!’ Regarding the jury that judged the photos, they indicated that ‘the Jury represented the industry's biggest names and tastemakers’, including The Royal Photographic Society, FoMu Fotomuseum, Fratelli Alinari, Stockholm City Museum to Torch Gallery in Amsterdam and more. Nice to have tastemakers involved…I think maybe they were from the Food Network. Three photographs either placed or got honorable mention and there were others that were nominated for judging. Here are the main three, and then I’ll just put the nominations in a gallery just in case you want to click them to see larger versions of those, which fell into the categories of Fine Art, Nature and Wildlife. Your trivia question: In what state is the Vermont PhotoPlace Gallery? OK, you got it – I’ll have to think of a harder question next time. Earlier in the year I had a photo accepted for exhibition for their ‘Traces Left Behind’ show. Here is that photo, which I titled, ‘Education Might Help’ – I think you will get the irony. If not, then education might help. 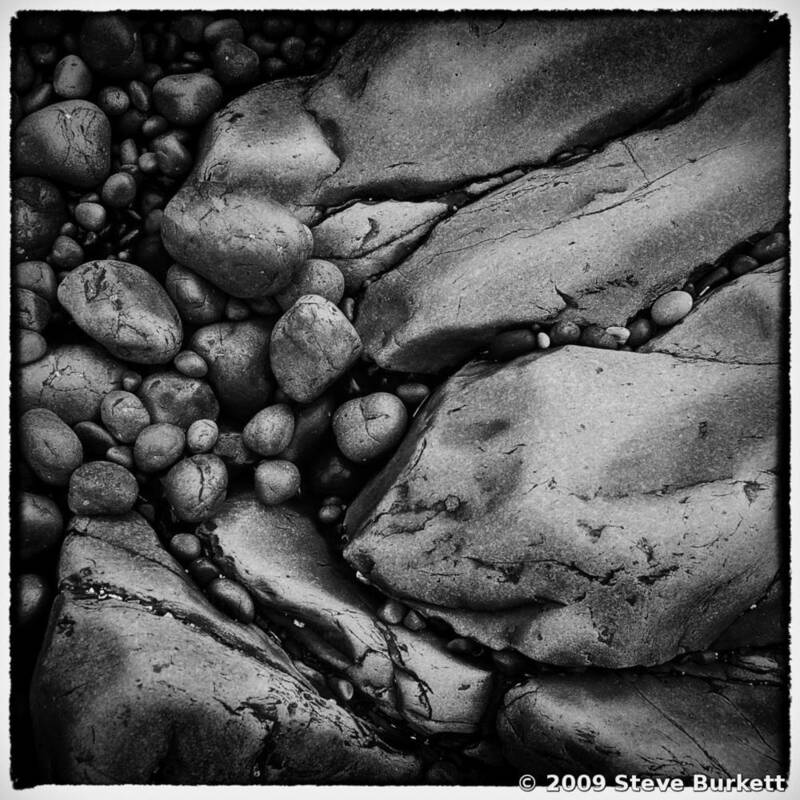 In September, another of my photos will be shown in their ‘Black & White’ show. 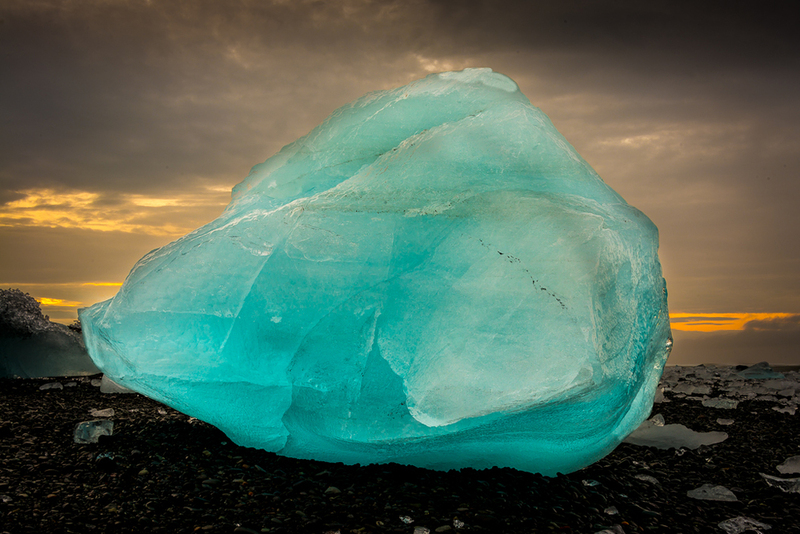 This is one of the beached icebergs that I photographed in Iceland last summer. I had not thought to convert the original color photo to black and white, because the colors in the original version are so vivid. But, I think it worked out quite well because of the brilliance of the crystal-clear ice. You be the judge. OK, here’s another trivia question: In what city and state is this gallery showing held? OK, you got it again!!! How did you know it is Redding, California!? Maybe I shouldn’t say this, but I had no idea I was doing that…but I’m glad it worked out that way. Here is the forbidding and exquisite 'air, water, earth and fire' photo, which I’m happy to say sold during the show.